Unlike most of the rest of the Island, electricity supplies to St Helens were supplied by a local company. In 1899, 'Edmund Ironside Bax and others' applied for permission to supply electricity 'within the Urban District of St Helens' - the roads defined in the order cover Seaview and the St Johns' area. Nothing has been found about a generation plant, a 1911 trade directory gives the address of St Helen's Electric Lighting Co. Ltd. as Bennett Street, Ryde - the same road where IW Electric Light Company had a generating plant, so possible the St Helens company was a distributing company rather that a generating company. 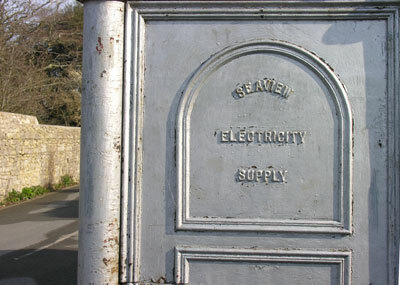 A Seaview Electricity Supply 'Distribution Unit', possibly from the time of the St Helen's Electric Lighting Co. Ltd., exists at the top of Oakhill Road, a similar unit existed until a few years ago in Seaview at the junction of Old Seaview Lane and Church Street. By 1931, the company had been taken over by the IW Electric Light Company.